Unlike Sky vertion it is an adventure so compeling it is hard to put down, sadly I am unable to get hold of the next book in the seris either in b00k or electronic format. I now have servere withdrawl symtoms. 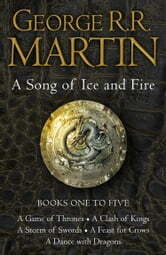 Brilliant series, book 4 a little slow but got back on track by book 5. Waiting with bated breath for 6! This series is astonishingly well-crafted, with plenty of subplots and convoluted political scheming to keep the reader occupied. Characterization is well-rounded and never simple. The only bad thing is the series is unfinished and the author takes forever between books.